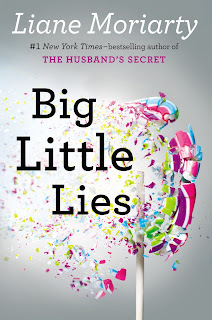 I read Lianne Moriarty's fun Big Little Lies a few months ago, but with a busy weekend and not enough time to tackle some of the more ambitious projects I had planned (Neapolitan pizza or cream puffs coming soon! 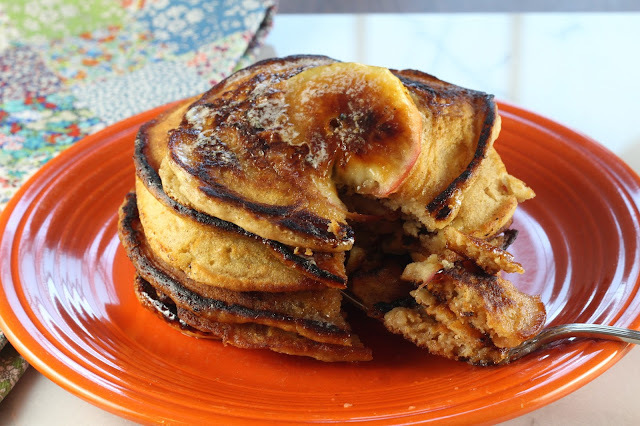 ), some easy apple pancakes were the perfect choice this weekend. I have read a few Moriarty books and she creates a really engaging "Real Housewives of Sydney" type of world, but with more depth and less trashiness (and plastic surgery). In Big Little Lies, Moriarty creates both characters and a story that are funny and slapstick one moment, and dark and sad the next. This juxtaposition makes the book a little more than the typical light read. As the title suggests, the book has some secrets that are eventually revealed, so I will be careful and keep the review short and sweet. The pancakes are inspired by the hunky neighborhood coffee shop guy, who always seems to be trotting out some delectable special pancakes when one of the books main characters, Jane, is sulkily hanging around. 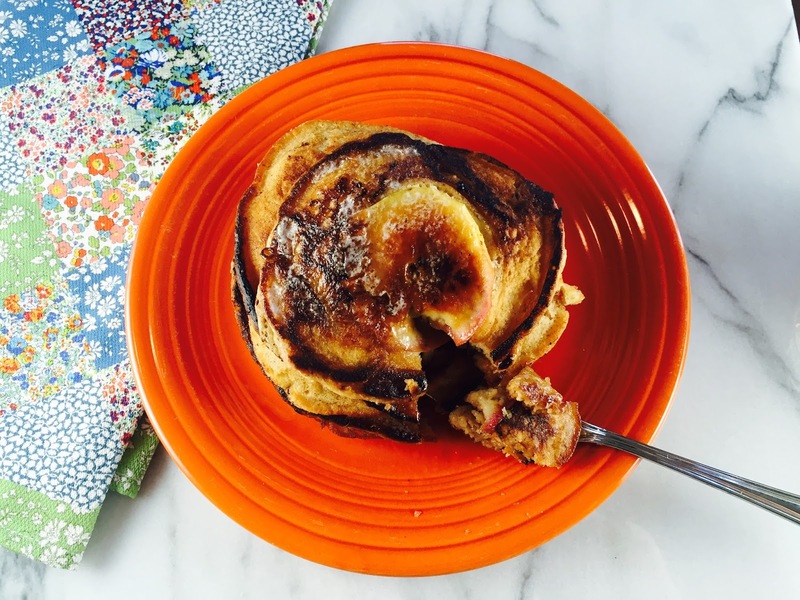 These were an improvisation, so hopefully the recipe will work for you. A wealthy beach suburb in Australia (Pirriwee Beach, doesn't that sound nice! )is where Lianne Moriarty's Big Little Lies take place. Most of the town gossip and activity revolves around the local school and the alpha Moms that run the Australian version of the PTA. The book starts with giving us a tease - something dramatic and horrible happened at the yearly trivia night fundraiser for the school - we don't know what, the book starts with commentary on what happened and then works its was from 6 months before the trivia night up to the big event. At the center of it all is Madeleine - a kooky but sharp mother of three. Madeleine's oldest child is from her first marriage, and her ex husband, who abandoned her and the child over a decade ago, now lives in the same town with his new, younger, yoga-fied wife, with a child in the same kindergarten class as Madeline's youngest child with her new husband. This causes Madeleine a lot of angst, and she is character that has bits of both lovable outcast and mean girl in here. Her best friend is the beautiful and aloof Celeste, who has two towheaded twin boys that are always trying to kill each other. Celeste seems to have the perfect life - a rich, seemingly thoughtful gorgeous husband - but she often seems like she is in another place - never truly present or open. Add to the mix Jane, a high strung young single mother new to town, whose son Ziggy gets in to serious trouble his first day of school by (allegedly) getting into an altercation with a little girl with a very vocal moher. Madeleine and Celeste, sensing an underdog in need of some support, take in Jane and take up her cause - creating a bit of a war at Pirriwee's elementary school. As the book progresses towards trivia night there is conflict, heartache and secrets are revealed - some predictable, some a bit shocking. 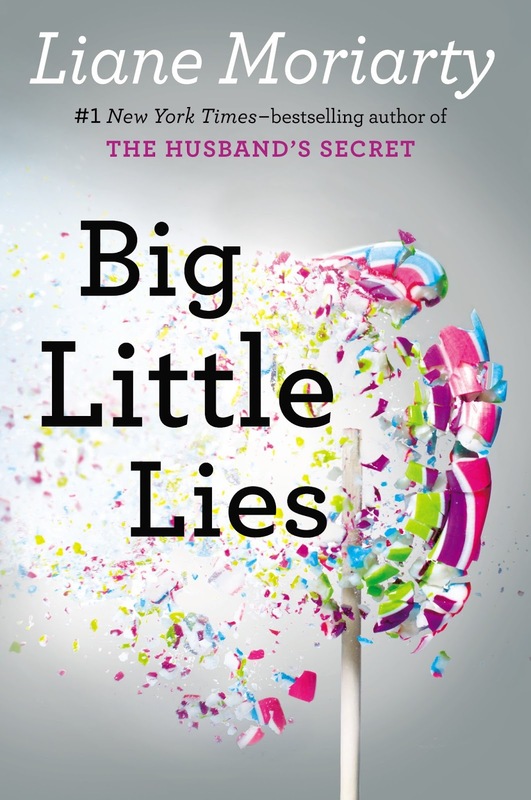 Big Little Lies is an enjoyable read - perfect when you need to give yourself a treat. 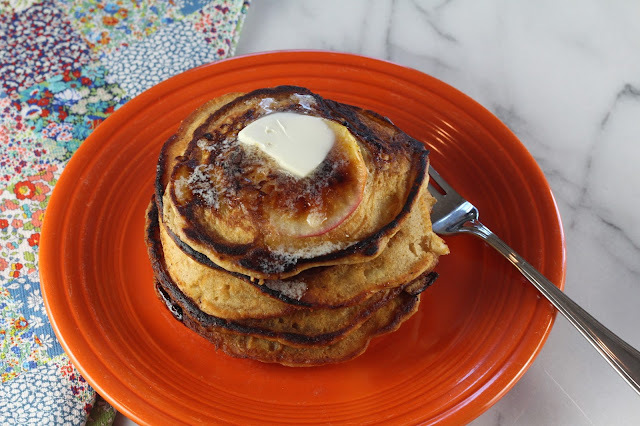 Also a treat are these apple pancakes. The local beach cafe, Blue Blues is a touchstone in the book where Madeleine, Celeste and especially Jane come to to calm down and regroup after the latest calamity. The cafe is run by the cute Tom, who is always trotting out with some decadent muffin or pancake dish. These apple pancakes are easy but kick your morning game up a notch. Stir together flours and all other dry ingredients in a large bowl. In a medium bowl, whisk together the milk, eggs and vanilla. Stir the wet ingredients into the dry ingredients and then stir in the butter. Heat some butter in a large skillet. Sprinkle apple slices with sugar and then place, sugar side down, on hot skillet. Spoon pancake batter over the apple slice, covering and surrounding it. Cook until bubbles form on the outside ring of the pancake - about 5 minutes, then flip and cook 3 - 4 minutes more until nice light brown.